Read about our favorite spots for a Midwest honeymoon and the best travel tips. When it comes to honeymoon destinations in the U.S., the Midwest is often outshined by better-known spots around the country, whether it’s the sunny beaches in Florida or the rolling hills of Napa Valley. But there are plenty of amazing places for a Midwest honeymoon, especially if you’re an outdoor-loving couple. Read about our favorite Midwest honeymoon spots and travel tips. While most parts of the Midwest are year-round destinations, we recommend visiting during the spring, summer and fall if you can. Winters are usually cold and snowy, especially in northern states like Wisconsin, Illinois and Michigan, so plan accordingly if you are planning a Midwest honeymoon at that time. From bustling cities to small towns and off-the-grid campsites, the Midwest is full of unexpected honeymoon destinations. Here are just a few of our recommendations for a Midwest honeymoon. 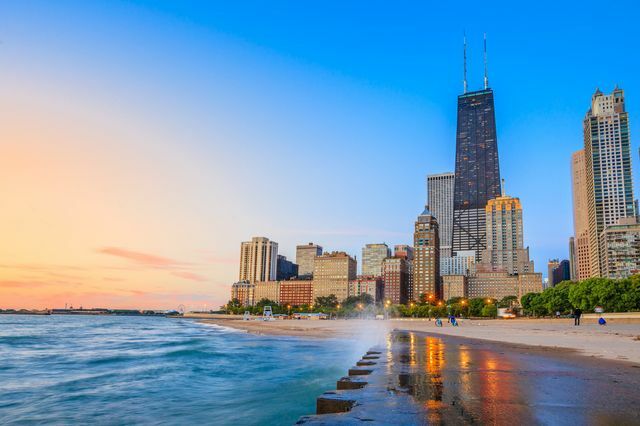 The Windy City has something to offer for all types of honeymooners. If you’ve never been, think of it as the Midwestern answer to New York City. Love musicals? Stay in Chicago’s theater district to catch dinner and a show, or see an improv comedy set at Second City. Take in the sights from 103 stories up at the Willis Tower Skydeck, or cruise along the Chicago River for an unbeatable view of the city’s stunning architecture—and a romantic Midwest honeymoon experience. Last but not least, your Chicago bucket list isn’t complete without trying a classic deep-dish pizza! The most unique thing about this island in Lake Huron is the lack of cars. In fact, Mackinac Island is the only place in the U.S. to ban them completely — residents voted to prohibit all motorized vehicles (save for police cars and emergency services) in the late 1890s. Instead, bicycles and horse taxis are the main mode of transport for everyone on the island. 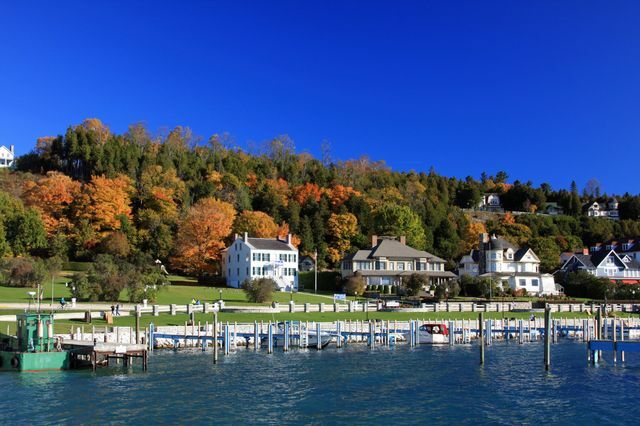 This storybook island is the perfect spot for a romantic honeymoon spent spent strolling past Victorian-era buildings, idyllic cottages, boutique stores, and local fudge shops (a Mackinac Island tradition). Made up of clear blue water and rocky, tree-topped cliffs, the Apostle Islands National Lakeshore looks more like an unreachable corner of the world than a national park in the Midwest. The difference is that you won’t have to leave the country to experience this enchanting destination — the islands are located in northern Wisconsin, approximately four hours from Minneapolis and six hours from Milwaukee. Adventurous couples will love exploring the dozens of dramatic sea caves and sea stacks by boat, while romantics at heart can enjoy a sunset cruise or visit the Apostle lighthouses. In the winter, the famous sea caves transform into ice-covered wonders. Bayfield is the perfect home base for couples who want to honeymoon in the Apostle Islands. This waterfront town has a cute main street and was nicknamed the “Berry Capital” of Wisconsin, since it’s surrounded by farms and orchards. A road trip through the Ozark Mountains is the perfect Midwest honeymoon for anyone in search of adventure — with a little bit of luxury thrown in. Spend your days exploring the beautiful Ozark wine country or hiking through the Ozark National Forest. When you’ve had enough of the great outdoors for one trip, check into a boutique hotel or B&B in a quaint Ozark town. Visit Springfield, Missouri for great antique shopping, day spas, and hip cocktail bars. Travel farther south to Fayetteville, where you’ll find a cool food truck scene and locally-owned art galleries. If it’s untouched wilderness you want, head to Sleeping Bear Dunes in western Michigan. This national park along Lake Michigan has 65 miles of stunning shoreline that will transport you back in time — the rugged coast, which is actually the remnants of ancient glaciers, features towering sand dunes, boulders and white bluffs. Sleeping Bear Dunes is a honeymoon nature lover’s paradise, with plenty of opportunities for hiking, fishing, rock climbing, boating, swimming, and even scuba diving. There are a number of campgrounds in the park, along with a variety of hotels, inns and rental homes in nearby Traverse City. I'm looking for somewhere to go on our honeymoon. We live near St Louis and don't want to go to far. Within driving distance I guess. We have thought about Nashville. Any ideas?